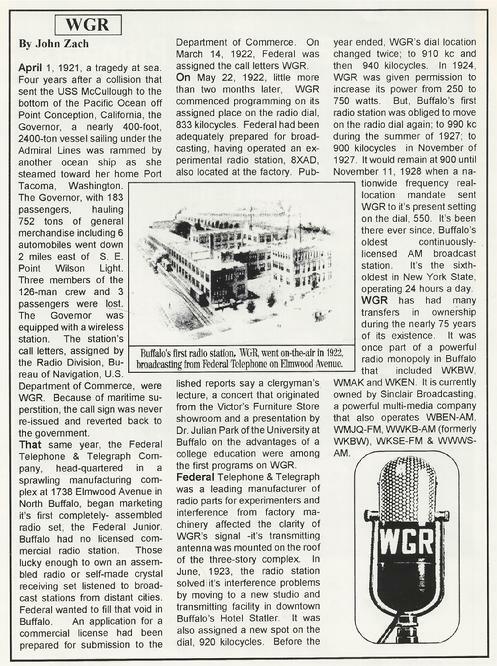 May 22, 2012 marked the 90th anniversary of modern broadcasting in Western New York. 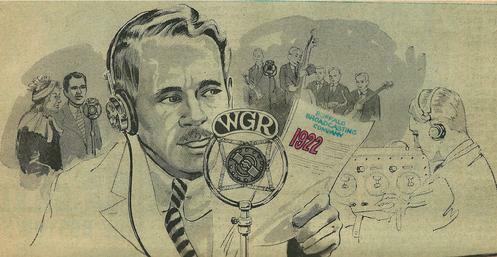 In 1922, the Federal Telephone & Telegraph Company signed on its radio station WGR for regularly schedule broadcasts. Studios and transmitter were located on top floor of their building located at 1738 Elmwood Avenue. 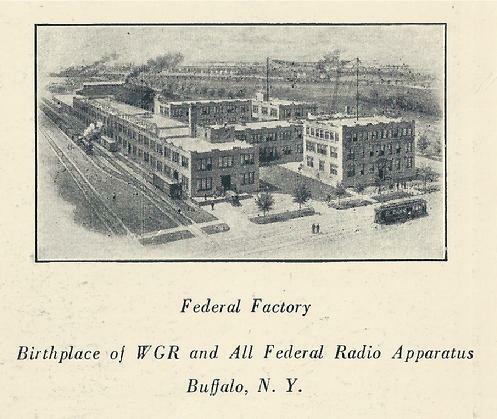 From a published report in the Buffalo Evening News, May 22, 1922: "WGR is the highest powered broadcasting station between Schenectady and Detroit and is said by radio experts to have by far the highest percentage of efficiently in the country. The station has been attractively arranged and furnished. The broadcasting room is hung with heavy gray drapes. These are not only pleasing to the eye but necessary to kill off any ring or echo that might interfere with the broadcasting as they improve the acoustics. There is an adjoining lounge and waiting room comfortably arranged with wicker furniture." The first day’s programing included an address and prayer by the Rev. Michael Ahern, President of Canisius College, a concert by the Yankee Six Orchestra, a discussion on the growth of Buffalo business by Albert Kinsey, President of the Chamber of Commerce and a presentation on the advantages of a college education by Dr. Julian Park, from the University of Buffalo. 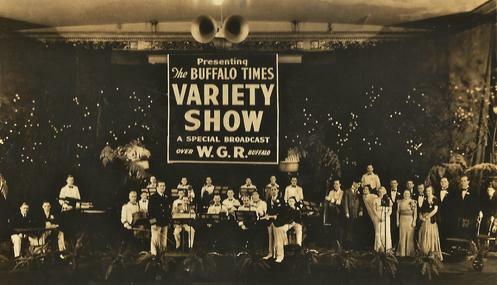 Although tradition holds that WGR was Buffalo's first radio station, the reality is that station WWT signed on the air earlier, April 16, 1922, but ceased broadacsting on October 2, 1922. 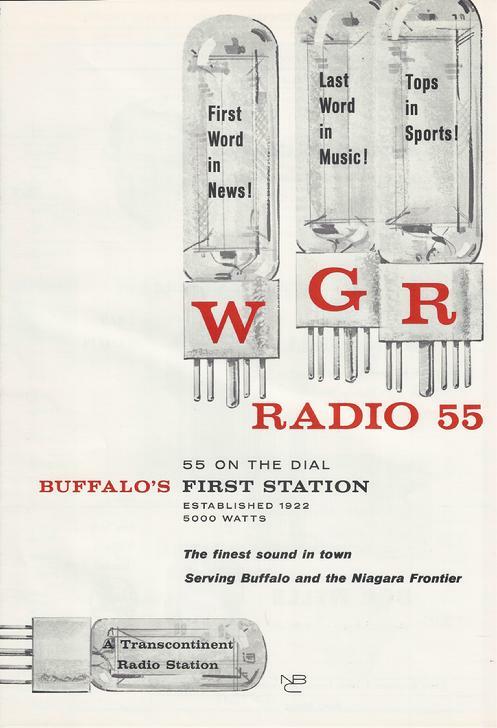 With WGR's sign-on, we celebrate 90 years of uninterrupted broadcasting. 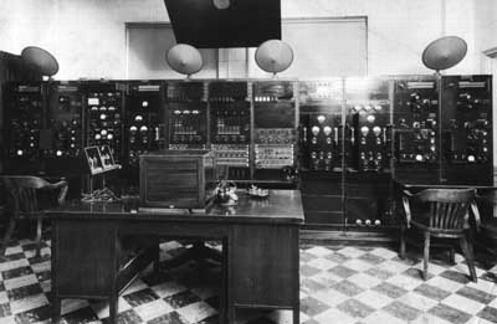 An early picture of the WGR transmitter. 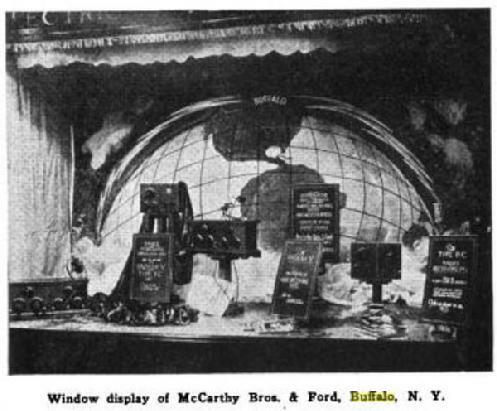 McCarthy Bros & Ford were early pioneers of Broadcasting in Buffalo. Electrical contractors, the company signed on WWT in April of 1922. Vintage radio: Recordings from the early days of Buffalo Broadcasting are rare. These two clips from the 1940s are some of the earliest recordings to have survived. The site of WGR's first broadcast was the Federal Telephone & Telegraph Company's building located at 1738 Elmwood Avenue. The building still stands today (2012). After 90 years, the name of the building's owner still can be seen. 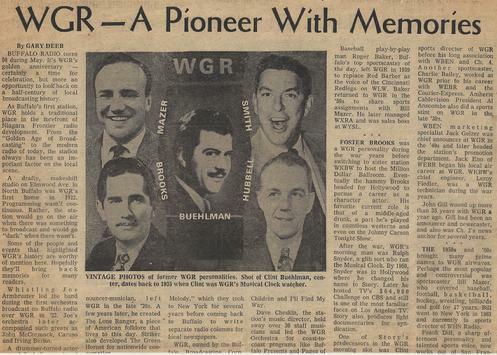 A brief history of WGR written by Buffalo radio legend John Zach. Click image to enlarge. WE NEED YOUR BUFFALO PHOTOS!! Did you have your picture taken with Commander Tom at the Erie County Fair? 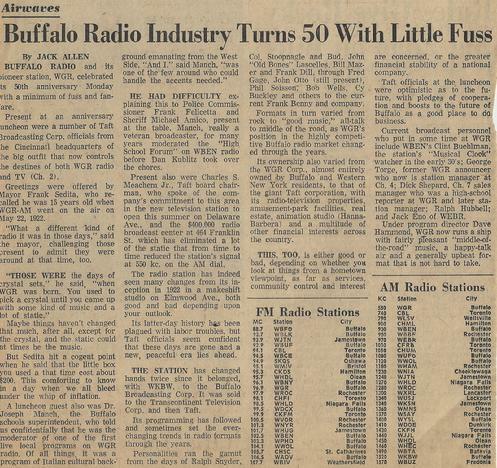 Do you have a Grandparent who worked in Buffalo radio or TV during the “golden age” of broadcasting? Do you have an autographed picture of a local DJ from a high school sock hop collecting dust in your attic? If you do, two of Buffalo’s foremost “pop culture” historians need your help for a series of upcoming projects. E-MAIL: Scan your photos at a minimum of 300 dpi. Send to ForgottenBuffalo@aol.com. Include a detailed caption if you can. PHONE: Have a question? Call us? 716-833-5211. In many local cases, we can pick up photos, scan and return in the same day! WHAT WE’RE LOOKING FOR: Right now, we're collecting radio and TV photos, but as you comb your collections, set aside other classic Buffalo shots as well. Whether it’s a picture of Gramps drinking a Simon Pure, your brother checking out the AM&As windows, you and your cousins having fun at Fantasy Island or Crystal Beach, or just a photo that shows some great Western New York scenery, We'd love to see it! You can follow the submission steps above. You will receive photos credits in any of our web & book projects. ALL PHOTOS TO BE RETURNED IF REQUESTED. PHOTO CREDITS TO BE INCLUDED. 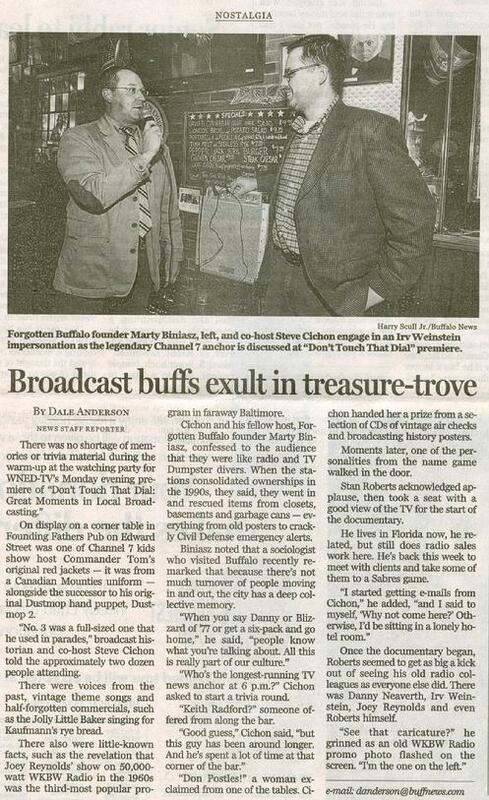 Buffalo News - Dec 7, 2010 - Click on image to read.